Dr Alaa Murabit, 25, is the founder of the Voice of Libyan Women, a women’s empowerment and development organization which focuses on women, peace and security through both practical on-the-ground measures as well as legal and policy change. 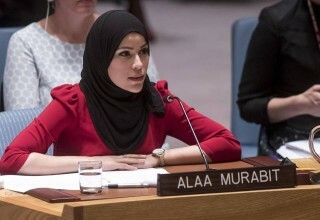 She addressed the United Nations Security Council Open Debate on Women, Peace and Security earlier this month, as one of three civil society guest speakers. Mr. Prime Minister, Excellencies, Ladies and Gentlemen, fellow members of civil society, thank you for the opportunity to address this historical session, she began. As a child, my mother told me she always saw everything, courtesy of the two extra eyes she had in the back of her head. I made many attempts to disprove her, and needless to say, I was caught every time. What I didn’t know then was that my mother had just taught me a valuable lesson that I would use daily as a peace and security advocate: that the very women who lead families and societies know first, and best, what is happening in them and how to address it. My organization, The Voice of Libyan Women, launched its first national project, the “Libyan Women’s charter”, in 2011. In the midst of revolutionary euphoria, we spoke with thousands of women who expressed their excitement for the potential opportunities that awaited them. But even then, they recognized and spoke of the challenges. Of how tensions would grow if transitional justice and reconciliation were not sought through legitimate structures, of the growing security risk of the open Sahara border, and of their increasing exclusion from the political arena. They listed their priorities with clarity and purpose: to get “the weapons out of our homes” and their family members back to work. As history has since proven, their words were the truest reflection of the impact of unaddressed conflict and increasing insecurity. But women did not just speak. As men vied for power or property, it was women who began to piece the country back together. It was women who, in record numbers founded organizations and initiatives, and through education, media, or political reform, were fighting for a truly “free” Libya. Over the next three years, women were the first to feel the effects of ongoing fighting and the first to notice the signs of rising extremism. In fact, as early as 2012, they warned of the increasing danger in driving alone, the increasing calls for school segregation and of how religious manipulation was being promoted by religious and political leaders to polarize their societies. It was on this basis that my organization launched “The Noor Campaign,” led by women and built on their partnership with men and religious actors to build peace and security in Libya. By leveraging the strengths of the women in our national network – their ideas, community credibility, unparalleled networks and influence – we were able to reach communities, men and boys in particular, in staggering numbers, enlisting them as our partners in countering extremist messaging and preventing violence. As a member of the 1325 Global Study Advisory Board I can tell you, our experience in Libya is not unique. In conflict and post-conflict countries around the world, women are seen as less threatening politically and economically, garnering more societal trust than their male peers. In fact, the importance of including women seems to be a glaringly obvious strategy. As recent events have made clear, extremist organizations not only recognize women’s agency, but they are extremely effective at speaking to and working with women for their own advantage, to the detriment of global peace and security. We know how much the Women, Peace and Security agenda needs the continued commitment of the United Nations. This is an undeniable fact. However, a less admitted truth is that the United Nations and its Member States are not meeting the expectations of the global community, and that is because they continue to ignore the one tool that has never been more urgent for us to utilize: the participation of women. The ongoing peace process in Colombia, for example, has so much to teach us. After over 60 years of war and countless peace processes – all exclusive and all failed – the political process opened up with the help of the United Nations and Norway’s mediation. Both sides brought victim’s voices and experiences to the negotiating table, 60 per cent of whom were women and they humanized the war, mobilizing their communities to support the peace talks. I wish we had a civil society representative from Colombia here today, to show us what gains can be made when the United Nations and member states work together to ensure inclusive peace processes. From my own experience in Libya, I know the only reliable requirement for admission to peace talks is a gun. The lack of actionable commitment – by the UN and its Member States – to women, peace and security beyond these walls only validates those who exclude women from these negotiations. The United Nations must prioritize the inclusion of women at home. A few years ago, religious and political actors met with members of the international community in Libya to discuss transitional justice and rising city and tribal tensions. As they were seated, one of the international representatives thanked the Libyan counterparts for attending. Women’s inclusion is paramount to global stability, and our action on the ground needs to reflect our commitments on paper. I would like to make three recommendations, based on the extensive work of myself and my civil society colleagues working on women, peace and security globally. First, conflict prevention is paramount to ensuring global peace and security. Rather than only reactively addressing erupting conflicts and adopting overly militarized “band aid” responses which promote, rather than diffuse, local conflicts, the United Nations, Member States and the Security Council should instead address the underlying drivers of conflict. Resources, expertise and influence should be concentrated on the prevention and mitigation of conflict. This means focusing on: justice, global disarmament, effective economic policy, representative political structures, accountable media and social reform. The participation of women is critical in the prevention of conflict. Women already engage in unofficial prevention practices in their community, and this should be recognized and institutionalized into official early warning systems and programs. And the engagement of women cannot continue to be one of convenience, where women are only included to implement processes that the United Nations and Member States have decided in their absence. Women be engaged in the very onset, at the decision and policy making level. The “Countering Violent Extremism” agenda, for example, is a militarized one and does not prioritize addressing the root causes. The aim of women peace activists is to prevent violent extremism in the first place. Second, we urgently need a mechanism to address crisis situations. Emergencies are not gender neutral. Research has proven they disproportionately affect women and girls, often assaulted, exploited and abused for personal and economic gain. Women’s rights are violated as they are forced into marriage by armed groups, forced into religious conversion, and women’s rights activists are targeted for violence for their own activism, or for that of male family members. While there have been increased efforts to ensure more effective gender programming by organizations and Member States alike, they are uncoordinated, unenforced and insufficient. The United Nations needs to create an accountable and authoritative “first response” structure within the Security Council, such as an informal expert group, which will guarantee greater coordination throughout the multilateral system and provide greater relief to women’s rights defenders who are at risk on the ground. Finally, there is an inarguable need to allocate adequate resources and increase the financial commitments made to women, peace and security. This must be accompanied by the removal of structural, political and bureaucratic barriers that limit the accessibility of funds and resources to activists on the ground. Dedicated contributions specific to programmes, led by women, which address the distinct needs of women in conflict and post-conflict environments are vital. There is no doubt that United Nations Security Council Resolution 1325 was a tipping point for the global community and the women, peace and security agenda, opening doors and shifting the political discourse. I’m of the new generation of women peace activists – from a country that was under dictatorship 15 years ago – but the 1325 agenda proved to be relevant to me and no doubt will be to women and societies in other countries. But we cannot forget that it was the relentless leadership of civil society activists, veterans of the struggle for peace, that ensured the adoption of this very resolution 15 years ago. And we are not backing down. Every day we put our lives on the line and do our part for peace. It is time for the United Nations and Member States to do theirs. Only by partnering with women and civil society organizations on the frontlines can we counter the rising threats of insecurity: be it extremism, resource exploitation, mass migration, global warming and any of the myriad causes of conflict. It is time we shift our support back to where it matters most: women. When the Security Council finds it unthinkable to address a crisis without addressing women’s rights; when humanitarian responders have full funding for their gender-specific services; when women grassroots leaders find their work fully funded and politically supported; when it is unimaginable that peace talks be held without women’s full engagement: only then will the full potential of 1325 be realized. And she ended her speech with a polite ‘thank you’.